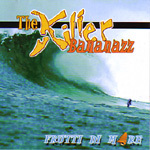 Album two from Dutch garage-surfers the Killer Bananazz. Hard charging, sometimes very well thought out, and always high energy surf. Riffin' progressions and loud guitar drive hard for the night time. The guitar needs a little more variation, but the track satisfies, especially the trumpet and power-drive glissandoes. "Alohamora" rips with power and style. The double picked lead guitar romps atop ambient drums and solid bass. The tribal drums provide a constant fever beneath the very enticing melody line, which is aggressive and just a little sad, and dribbles like water from a turbulent sea. Based in part on Larry Weed's "Moment Of Truth," this song rips and dodges, and is amped by whammy chords and trumpet bridge duels. Powerful and fast. Grumbly and whammified, "Frutti Di Mare" thunders along a long and dangerous ride on a murky gray face born of a tropical storm. dark, yet optimistic, sporting a cool riff, and well developed. On the gruff side, "Ocean Reef" is more like a stormy big surf pummeling than a mere reef. Trumpet break, semi-exotic double picked guitar leads, and great drums! Big whammy chords, racing drums and modern guitar tone slice through the night with a jagged razor's edge. The trumpet bridges are an interesting contrast to the main guitar riffs. Cool stuff. Man Or Astro-MAN? 's "Joker's Wild" gets the big whammy treatment, with fire and assault, and interesting trumpet accents. Cool. Gypsy cries of "hey hey" pump across a romping hard driving surf rhythm, punctuated by trumpet bridges. Thrashy stompin' garage surf with angst! A Spanish lesson, some Spanish shouts, a stompin' riff rocker, reverb, and brash energy in a stop-start format. Olay!